I am staying in the small village of Soufriere on the western side of St. Lucia, an island in the eastern Caribbean. I arrived on St. Lucia’s Independence Day, a celebration of its transition from British colony to sovereign nation on February 22, 1979. As I drove on slim, curvy, mountainous roads with dangerously deep rain gutters toward the small town of Soufriere, I was met by hundreds of motorcycles and cars with little blue flags attached to their roofs driving in the other direction. Roadside traffic jams were common. People cheered, drank local Piton beer, and played reggae and ska music. It’s a tradition for island residents to drive from town to town around the island counter-clockwise, celebrating in each place along the way. People on neighboring islands ship their motorcycles over to St. Lucia to join in. The celebrations reminded me of Western Europe’s dark colonial past, and the many young nations around the world still grappling with the traumas that were left behind. I traveled to Soufriere to learn about a pilot project that CLEAR Caribbean, a UK-based nonprofit, developed to restore the area’s coral reefs. After dive volunteering with the Coral Restoration Foundation, I was curious to see a coral garden in its infancy. I had heard great things about the organization's bottom-up strategy, empowering local people to be a part of the solution to restoring fisheries and coral reefs. According to Newton Eristhee, CLEAR’s Operations Director, Staghorn and Elkhorn were once the most common coral species in the Caribbean. White band disease - likely introduced by humans through cruise ship bilge pumps - practically wiped them out in the 1980s. They are so rare now that in the United States both are listed as threatened under the Endangered Species Act. When I was snorkeling the day after my arrival, I saw one Elkhorn colony by itself and had trouble comparing it to the pictures I had seen of the same species covering entire reefs. Newton, CLEAR Executive Director Owen Day, and Chester Nathoniel, the local diving guide, are trying to reverse this trend in St. Lucia. In May 2017, with funding from the Sandals Foundation, they set up two coral gardens within the Soufriere Local Marine Managed Area (LMMA), which currently grow around 1,300 Staghorn and Elkhorn corals for future out-planting. Newton and others at CLEAR learned how to develop coral nurseries from the Coral Restoration Foundation. CLEAR hopes to repopulate area reefs while empowering local people to grow and monitor them. Newton is working with Sandals Watersports on a sustainable funding source: using a portion of the scuba diving fees the resort charges to pay Chester’s crew to manage the coral nursery. Right now Chester and his crew are paid $500 per month, which isn't much considering the work involved. "If it was all about the money, he wouldn't be doing it," Newton remarked. 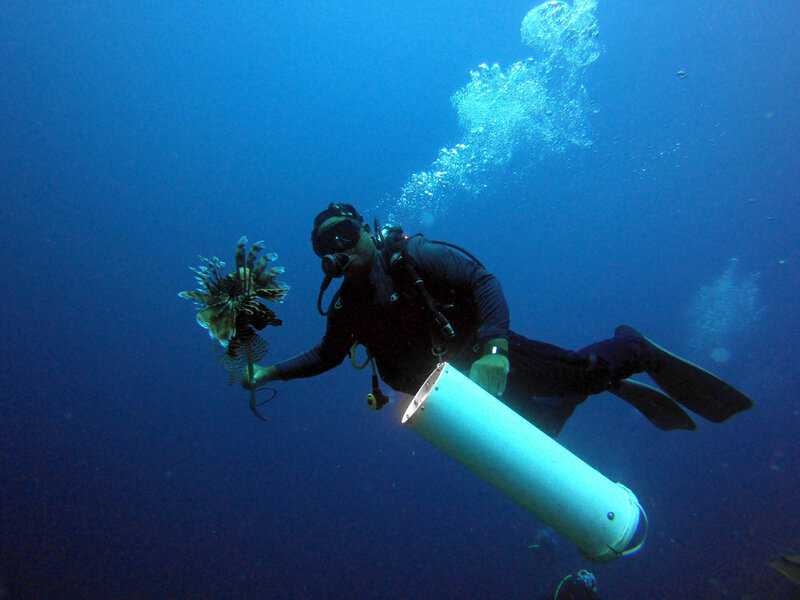 Chester Nathoniel with speared Lionfish in the Soufriere Local Managed Marine Area. From L-R: Owen Day, Newtone Eristhee, Chester Nathoniel, Maximillian Sylvestor and Michelle McNaught. Chester is the local dive guide and owner of Action Adventure Divers. Despite working out of a single hut and an open-faced boat that can hold a maximum of six divers, he is the highest-rated dive operator on the island. Good-natured, funny and smiling, Chester has been working in the ocean here his entire life. I dived with Chester for three days and was awed by the unusual assortment of corals and sponges that I encountered (see below). Despite the multitudes of small fish, large ones were rare. I suspect that the marine reserves are too small to prevent local fisherman from hooking most mature fish. Despite my amazement at all of the coral types in the local waters, Newton assured me this is due to shifting baselines: my awe at the current reef pales in comparison to what he witnessed doing fish surveys back in the 1970s and 1980s when Staghorn and Elkhorn were widespread and dominant. Chester carries a spear-sling when he dives that he uses to kill invasive Lionfish, which have become a major problem in the Caribbean over the last fifteen years. Likely introduced when a commercial aquarium spilled into the ocean during a hurricane, Lionfish have spread from Florida across the eastern seaboard and Caribbean. They are ravenous eaters of young fish and reproduce as often as every four days. Chester speared seven of them on one dive. Lionfish are native to the Pacific Ocean but have no natural predators in the Caribbean, so they have quickly multiplied (Click here for a graphic showing their spread). Newton is working on turning the exotic species into a new commercial fishery – training fishermen how to catch them and encouraging resorts to add them to their dinner menus. But creating a consistent supply is difficult. If they became a culinary delicacy, maybe commercial fishing could keep their numbers in check. No one will fault you if you haven’t heard of underwater coral growing. In fact, until a widespread bleaching event in the Great Barrier Reef in 2016, coral reefs hadn’t gotten much mainstream attention. Thanks to documentaries like Chasing Coral on Netflix, enhanced media coverage, and the recent international designation of 2018 as the Year of the Reef, you’ll hear a lot more about it in the coming years. Small tropical islands are faced with a number of challenges related to climate change including rising sea levels, the increased intensity of storms and loss of coral reefs. Coral loss is compounded by the fact that shallow reefs can stop upwards of 97% of wave action during storms, so when big storms hit shorelines are pounded harder than ever before. This leads to increased beach erosion and more life-threatening storm surges. 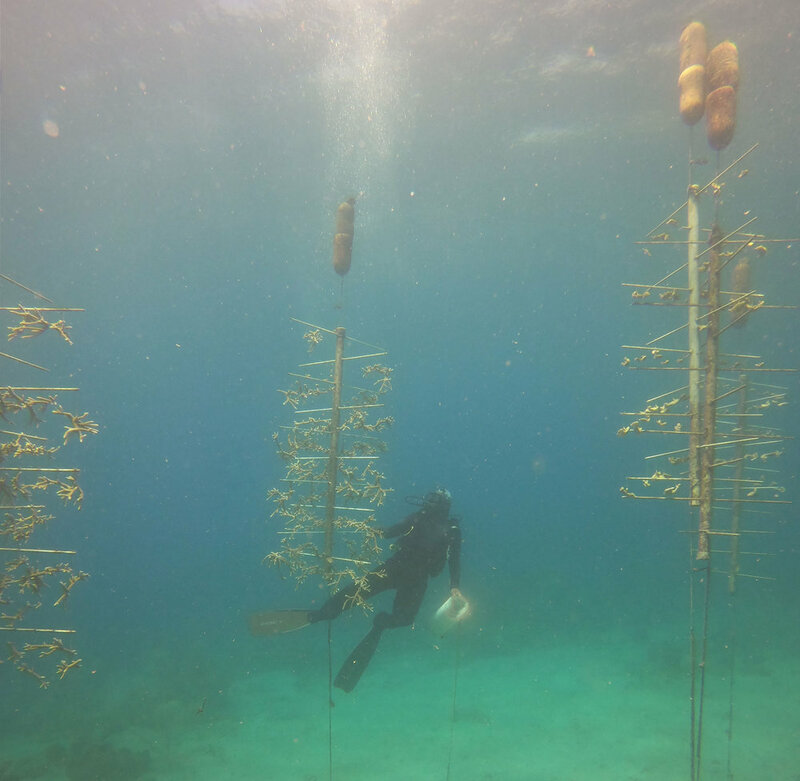 New coral nurseries continue to pop up around the globe as local people are empowered to restore what has been lost. When ocean water gets too hot for too long - usually during extreme El Nino events tied to climate change - many coral species become so sick that they expel the colored microalgae that they live in symbiosis with, causing them to turn white. While not dead yet, they have reached a crisis state and recovery is difficult. This is important, because while coral reefs comprise less than 1% of ocean habitat, 25% of fish species depend on them for food and/or shelter. Bleaching events – once rare and localized – have become five times more common than they were 40 years ago. Faced with this global phenomenon, Newton is focusing his efforts locally to restore damaged coral reefs while helping fishermen transition to more sustainable ways of using the ocean. He has a long history working on Caribbean fisheries, marine protected areas and now coral restoration. He and Owen started CLEAR Caribbean a few years ago, recognizing that local communities were a key element to creating lasting solutions. Newton is also working with St. Lucia's Ministry of Education to create a vocational degree in coral nursery management that he hopes will lead to the creation of a new class of regionally recognized, skilled workers who can manage nursery operations throughout the Caribbean. I have hope that a multi-pronged, integrated approach that includes sustainable fishing, reduced water pollution, marine habitat protection and coral restoration could be the key to helping marine species and coastal communities adapt to a warming planet. At this stage, a certain amount of climate change is inevitable for the foreseeable future, but we can all play a part in reducing our local impact and working to improve the resiliency of damaged ecosystems. Newton and Chester are great examples of local islanders working to protect and restore the natural places they hold dear. In addition to coral restoration, new Marine Protected Areas are being developed throughout the Caribbean to rebuild fish populations and improve coral reef resiliency. I look forward to visiting a few of these in northern Jamaica this month, including at least one coral nursery that Newton helped develop. I hope that local successes in St. Lucia and Jamaica will lead to model that other island nations can replicate.